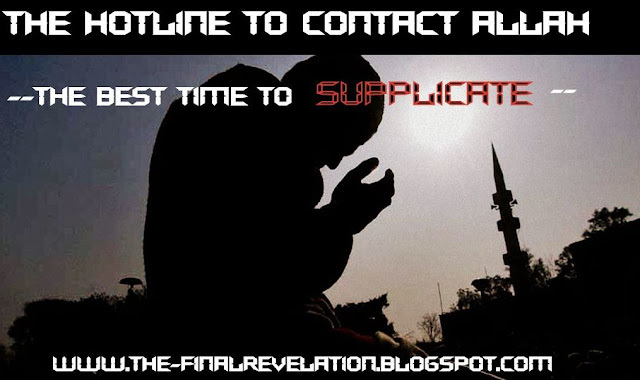 It was narrated from Abu Sa’eed that the Prophet (peace and blessings of Allaah be upon him) said: “There is no Muslim who does not offer any du’aa’ in which there is no sin or severing of family ties but Allaah will give him one of three things in return: either He will answer his du’aa’ sooner, or he will store it up for him in the Hereafter, or He will divert an equivalent evil away from him because of it.” They said: “We will say a lot of du’aa’.” He said: “Allaah is more generous.” Narrated by Ahmad (10749), classed as saheeh by al-Albaani in Saheeh al-Targheeb wa’l-Tarheeb (1633). * Aadam عليه وسلم made du`aa when he was removed from the Jannah. * Nooh عليه السلام made du`aa when he saw that the people will not benefit any further from his call. * Ibraaheem and Islaam`eel عليهم السلام made du`aa when they were building the Ka`bah. * Yaqoob عليه السلام made du`aa when trials got severe for him. * Yusuf عليه السلام made du`aa when then the wife of his master tried to seduce him. * Ayyoob عليه السلام made du`aa for the cure for his sickness. * Yunus عليه السلام made du`aa from the belly of the whale. * Moosaa عليه السلام made du`aa when the he killed the man was being pursued the Egyptians. * `Eesaa عليه السلام made du`aa to Allaah to provide them food from the Heavens. Anas (RA) narrated that Allah’s Messenger (SAW) said: 'A supplication made between the Adhan and Iqama is not rejected. 'The companions asked, “what shall we ask for Oh Messenger of Allaah (Sallalahu Alayhee Wasallam).” He (the Messenger of Allaah (Sallalahu Alayhee Wasallam)) said, “Ask Allaah for wellness/good health in his world and in the hereafter. Narrated Abu Hurairah (RA): Allah’s Messenger (SAW) talked about Friday and said: 'There is an hour on Friday and if a Muslim gets it while offering Salat (prayer) and asks something from Allah (SWT), then Allah (SWT) will definitely meet his demand.' And he (the Prophet (SAW) pointed out the shortness of that particular time with his hands. [Ref: Ahmad 3: 357 and Ibn Majah #3062, Sahih Ibn Majah 2484]. There was some difference of scholarly opinion concerning the phrase dabr al-salawaat al-maktoobah (“following the prescribed prayers”) – does it mean before the salaam or afterwards? Narrated Sahel Ibn Sa'ad (RA): that the Messenger of Allah (SAW) said: 'Two will not be rejected, Supplication when the Adhan (call of prayer) is being called, and at the time of the rain'. [Ref: Reported by Imam al-Shafi' in al-Umm, al-Sahihah #1469]. chapter heading The Chapter: Seeking To Have Duas Answered When It is Raining. Seek having your dua answered when meeting an army, during the iqāmah of prayer, and during rain fall. In another hadith : The Prophet (SAW) declared: 'Three du'as are surely answered: The du'a of the oppressed, the du'a of the traveler, and the du'a of the father/mother (upon their child)'. 14. Dua after praising Allah and giving salaat on the Prophet (SAW) in the tashahhud at the end of salat. 19. When Muslims gather for the purpose of invoking and remembering Allah (Dhikrallah). The Prophet (SAW) said: If a group of people sit together remembering Allah (such as studying, learning), the angels will circle them, mercy will shroud them, peace will descend onto them and Allah will remember them among those with Him. Abu Huraira said the Messenger (PBUH) of Allah (SWT) said: "The supplications of three groups of people's are not rejected; the du'aa (Supplication) of the fasting person when he is breaking his fast, the du'aa of the just Imam and the du'aa of the oppressed." “When the fasting person breaks his fast, his supplication is not turned back. So you may pray to Allaah and say whatever du’aa’ you think is suitable. The prophet (SAW) declared, 'Three men whose dua is never rejected (by Allah) are: the fasting person until he breaks his fast (in another narration, when he breaks fast), the just ruler and the one who is oppressed. Three men, amongst those who came before you, set out until night came and they reached a cave, so they entered it. A rock fell down from the mountain and blocked the entrance of the cave. Thereupon, one of them said: 'O Allah! I had parents who were old, and I used to offer them milk before any of my children or slaves. One day, I went far away in search of grazing and could not come back until they had slept. When I milked as usual and brought the drink I found them both asleep. I hated to disturb them and also disliked to give milk to my children before them. My children were crying out of hunger at my feet but I awaited with the bowl in my hand for them to wake up. When they awoke at dawn, they drank milk. O Allah! If I did so to seek Your Pleasure, then deliver us from the distress caused by the rock'. The rock moved slightly but they were unable to escape. The rock moved aside a bit further but they were still unable to get out. The rock slipped aside and they got out walking freely". The stoning of the small Shaitan (jamrat sugra), or the middle Shaitan (jamrat wusta) pillars during Hajj. It is narrated that the Prophet (SAW) would stone the small Jamarah (one of the three pillars that is stoned in the last days of Hajj), then face the qiblah, raise his hands, and make du'a for a long time. He would then stone the middle Jamarah and do the same. When he stoned the large Jamarah, he would depart without making any du'a. It is narrated that the Prophet (SAW) would make long du'as at Safa and Marwah. The Prophet (SAW) said that Allah the Exalted had said: ' I have divided the prayer into two halves between Me and My servant, and My servant will receive what he asks for. When the servant says: Praise be to Allah, the Lord of the universe, Allah the Most High says: My servant has praised Me. And when he (the servant) says: The Most Compassionate, the Merciful, Allah the Most High says: My servant has lauded Me. When he (the servant) says: Master of the Day of Judgment, He remarks: My servant has glorified Me, and sometimes He will say: My servant entrusted (his affairs) to Me. When he (the worshipper) says: Thee do we worship and of Thee do we ask help, He (Allah) says: This is between Me and My servant, and My servant will receive what he asks for. Then, when he (the worshipper) says: Guide us to the straight path, the path of those to whom Thou hast been Gracious -- not of those who have incurred Thy displeasure, nor of those who have gone astray, He (Allah) says: This is for My servant, and My servant will receive what he asks for. The suhoor falls in the last part of the night and therefore it is included in this period. It is also a sign of the believers and those who have taqwaa to seek forgiveness in their duas. Graded Hasan by Shaykh Al-Albani(May Allâah have mercy upon him) in Saheeh Adab Al-Mufrad. “His dua was answered on Wednesday between the prayers of Dhuhr and Asr” . (( لولا أَنَّ الصحابي - رضي الله عنه - أفادنا أَنَّ دعاء الرسول صلى الله عليه وسلم في ذلك الوقت من يوم الأربعاء كان مقصوداً - والشاهد يرى ما لا يرى الغائب وليس الخبر كالمعاينة - لولا أَنَّ الصحابيّ أخبَرنا بهذا الخبر؛ لكنّا قُلْنا هذا قد اتفق لرسول الله صلى الله عليه وسلم أَّنه دعا فاستجيب له؛ في ذلك الوقت من ذلك اليوم. [Partial] : If this companion wouldn’t have narrated to us that the prophet(peace and blessings be upon him)made Dua to Allâah during this hour we wouldn’t have known. The person present witnesses what the absent person doesn’t. This ahadeeth has significant meaning; since Jabir narrated the information when exactly his dua was answered. And this shows that the Dua for the Messenger(peace and blessings be upon him)was answered at that hour during Wednesday. Consequently Jabir began to do that same thing he saw Muhammad (peace and blessings be upon him) do on Wednesday between Dhuhr and Asr. End of Quote from the book. When saying the du’aa’, “Laa ilaaha illa anta, subhaanaka, inni kuntu min al-zaalimeen ([none has the right to be worshipped but You (O Allaah)], Glorified (and Exalted) be You [above all that (evil) they associate with You]! Truly, I have been of the wrongdoers – cf al-Anbiya’ 21:87]).” It was narrated in a saheeh hadeeth that the Prophet (peace and blessings of Allaah be upon him) said: “The prayer of Dhu’l-Noon (Yoonus) which he said when he was in the belly of the whale: ‘Laa ilaaha illa anta, subhaanaka, inni kuntu min al-zaalimeen ([none has the right to be worshipped but You (O Allaah)], Glorified (and Exalted) be You [above all that (evil) they associate with You]! Truly, I have been of the wrongdoers.’ No Muslim recites this du’aa’ concerning any matter but Allaah will answer him.” Narrated by al-Tirmidhi and classed as saheeh in Saheeh al-Jaami’, 3383. All good is from Allah whereas all the mistakes are mine. May Allah have mercy on the one who corrects me. Aameen.